We all know Barbie is a little out of proportion with her 175cm height, 91 cm bust, 45 cm waist, 83 cm hips and 22 cm neck! If she were a real woman she would be anorexic, unable to lift her head or menstruate, have a smaller waist than her head, only have room for half an intestine and liver and have to crawl to support her massively disproportionate body. An infographic shows the difference between Barbie and the Lammilly doll. Now it’s time to welcome the Lammilly doll, a more realistic version of Barbie. 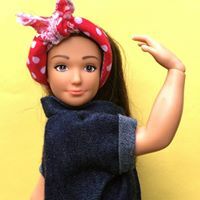 A doll which was rapidly crowd funded in the US to the tune of over half a million dollars, and is challenging the body image ideals perpetuated by the children’s toy industry. It comes with acne, cellulite and stretch mark accessories. Refreshingly real…..representing the average, healthy 19 year old girl, and not just white girls!